« Millennials May Love Socialism, But Socialism Won’t Love Them Back! No doubt in the past few months you have seen Rep. Jordan many times on various cable news programs as he speaks out regarding the very serious issues surrounding the investigations in Washington D.C. As a member of the House Freedom Caucus, Rep. Jordan is committed to having Congress “accomplish what the people sent them to Washington to do.” His commitment to truth and transparency has made this Congressman a front runner to be the next Speaker of the House of Representatives. Be sure to attend this meeting and get to hear and meet Representative Jim Jordan in person! He is the U.S. Representative for Ohio’s 4th congressional district, serving since 2007. A member of the Republican Party, and a founding member of the Freedom Caucus. In Congress, Jordan has also emerged as a prominent defender of the taxpayer’s pocketbook through his work on spending issues. In 2009, he introduced the only balanced budget alternative to President Obama’s budget. 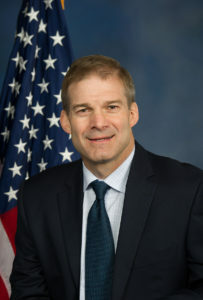 In the 112th Congress, Jordan served as Chairman of the House Republican Study Committee, the largest caucus of conservatives, advancing conservative ideas and solutions on Capitol Hill. In the 114th Congress, Jordan helped found the House Freedom Caucus, and served as its first Chairman. In 2018, he announced that he was running for the House Speaker position that will be vacant upon Paul Ryan’s retirement in January 2019. Representative Jordan, wife Polly, and their four children reside in Urbana Ohio.